Snack Girl wishes that there were amazingly yummy snacks to be found at her local grocery store. Frequently, we have to look harder for the best snacks out there. I am in the fortunate position of being sent snacks to review for this website. Many of the people who send me food are small businesses who are trying to get their product into larger stores. So, you may have to LOOK for these snacks - but, trust me, these are special and worth the extra work (and the extra cash). I plan to do a product round-up once a month to help out these business owners - hey, I'm a small business owner, too! 1. Euforia Thousand-Layer Spice Cakes are freakin' unbelievable (photograph above). You get a little individually wrapped slice of cake made with eggs, butter, flour (or no flour for a gluten free version), milk, spice, and salt. 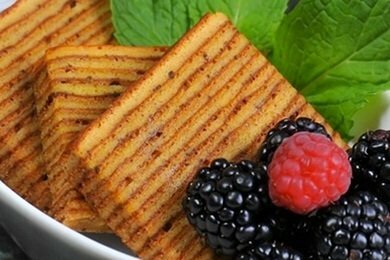 These are a great little treat for your afternoon coffee break - and you can skip the 600 Calorie Cookie that lurks in your local cafe. They cost about $2 each and you can buy them through the Euforia website or Amazon.com (see below). 2. Do you remember Snack Girl's favorite smoothie? I love making a mango lassi especially in the summer time. 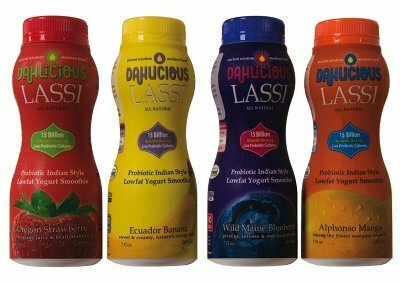 DAHlicious Lassi has put my mango lassi (and blueberry, strawberry, and banana) in a bottle and it is a great snack. Their probiotic blend of Indian style yogurt and real fruit is all natural, gluten-free, and made with rBST free milk from grass-fed cows in Vermont. They add just a little bit of sugar - 7 grams or a little over a teaspoon to get it sweet. Compared to let's say the same serving size of Dannon Greek - Dannon has 29 grams of sugar and DAHlicious Lassi has 17 grams. For me, it tastes just like the smoothie that I would make myself when I have the time. Whole Foods Market (New England, NY, NJ, CA), The Food Emporium (NY), Earth Fare (Southeast), The Fresh Market (Southeast, Midwest), and Lunds & Byrley's (MN). They are hoping to launch nationally via Whole Foods Market by the end of the summer. I certainly hope that the rest of the nation can get their hands on it. My favorite use for this product is a "treat" for my kid's lunch box. The packaging is SO cute and I know my kids would look forward to having this drink (instead of the school milk). They are about $2 each online and you can buy them from their online store. 3. Anyone who wants to send me ORGANIC beautifully made hazelnut spread and jam from Italy is a pal in my book. 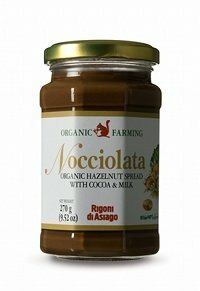 Rigoni di Asiago uses hazelnuts, dark chocolate, sunflower oil, skimmed milk, cocoa butter, vanilla, brown sugar, sunflower-lecithin emulsifier (not GMO) to make their hazelnut spread. All the ingredients are organic and free of added flavors, fats or artificial colors. This stuff is made with LOVE and is a bit pricey. This is a completely different animal than Nutella and one that I can whole heartedly endorse as a super TREAT. You can find it at Whole Foods and on Amazon.com (see below). Do you have any lovely "harder to find" snacks to share? Seriously addictive, but so hard to find in the stores! My favorite snack is Go Raw Spicy Seed Mix. It's dehydrated just right so they're actually crispy like toasted nuts. The seasoning is just perfect (no mystery ingredients) just jalapeno, lime, cilantro and salt, plus the health benefits of practically raw seeds. Sorry, sounds like a commercial, but I REALLY love them! So I am not so good at figuring out the "best" foods to buy. I dont quite get how to read labels to compare to others. I recently found an app for my phone called fooducate. I highly recommend it. You scan a food product and it gives it a grade. Then it explains (in English) why it got it's grade. It also gives you healthier choices. It just doesnt seem to take the organic part into consideration. But it's been helping me make better choice and not fall for the hype of the packaging.